KISS 3 3/4-inch scale action figures of the original band members. Comes with character-specific clothing and accessories based on the band's 1979 Dynasty tour. KISS has been rockin’ arenas around the world for over forty years. Their spectacular shows have delighted audiences with levitating drum kits, pyrotechnics and of course blood spitting. Now the outrageous original members of this world renowned rock band are available as 3 3/4-inch scale action figures from Bif Bang Pow! Each of the KISS Dynasty 3 3/4-Inch Scale Action Figures feature detailed character-specific clothing and accessories based on the band's 1979 Dynasty tour. These exceptional figures feature 11 points of articulation. 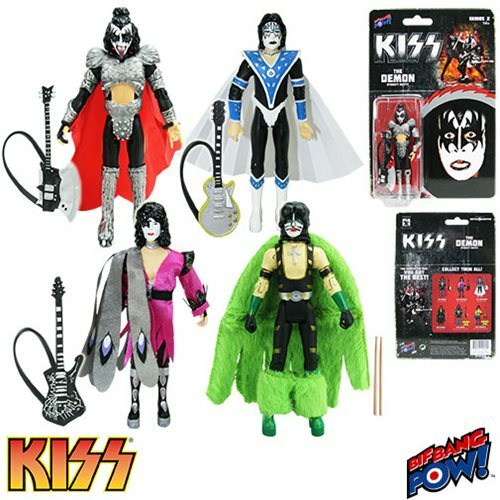 The Demon, Starchild, and Spaceman each come with a guitar. The Catman has a pair of drumsticks. Pose each figure with his accessory in all your favorite rock positions! If you’re a fan of KISS you’re going to want to collect them all! Ages 14 and up. KISS is a hard rock band founded in New York in the early 1970s. Known for their outrageous makeup and costumes, each member of the band adopted their own unique comic book style persona. Vocals and bass guitar player is The Demon, vocals and rhythm guitar player is The Starchild, on drums is The Catman and lead guitarist is The Spaceman. However, their look isn’t the only thing they’re known for. Since their formation, KISS has put on very extravagant live performances that include fire breathing, blood spitting, levitating drum kits, rockets and other crowd-pleasing pyrotechnics.